Despite complaints, a Utah high school held Men’s Week again this year. But ‘thoughtless’ banners have ended the event for good. 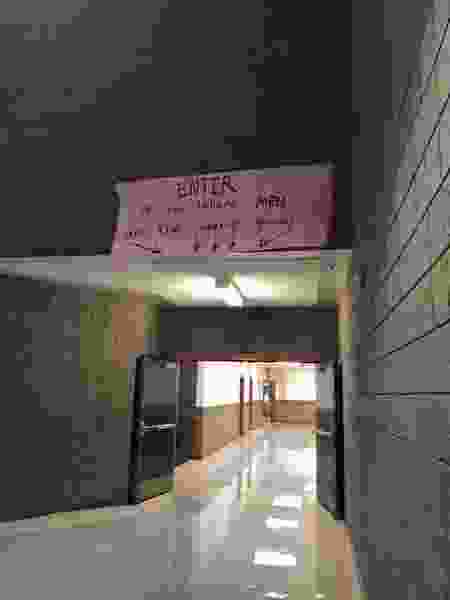 (Photo courtesy of Rik Andes) A banner at Snow Canyon High School cautions students, "Enter if you believe MEN are the superior gender." The sign was one of several that students hung Oct. 22, 2018, in celebration of "Men's Week" at the school, district officials said. The school discontinued its Battle of the Sexes activities — including a "Women's Week" in February — after students and parents complained that the events were reinforcing harmful gender stereotypes. That was the message on a banner hanging over a hallway Monday at Snow Canyon High School in St. George, announcing an annual celebration called Men’s Week. After multiple years of objections from students and parents, the high school has agreed to end its annual Battle of the Sexes activities and cancel this year’s Women’s Week, set for February. But some parents say the school for years has ignored complaints that the Battle of the Sexes promoted sexist tropes and hostility between students. “I’m really surprised and disappointed,” said Kim Nordquist, whose daughter posted photos of sexist banners on social media when she was a sophomore in March 2017 — and faced backlash from other students when the signs were removed and some activities canceled. On Monday, Men’s Week festivities kicked off with a “Mr. Warrior” assembly, during which a coach admonished students not to take the celebration too seriously, apparently pushing back against the earlier complaints, Dunham said. “I’ve heard that a coach mentioned, ‘Don’t get offended at this, it’s all in good fun,’” Dunham confirmed. Among the week’s planned events were an arm- and leg-wrestling contest, a Smash Brothers video game activity, and early dismissal and free pizza for the boys on Friday, Dunham said. Friday’s event was extended to all students, and the wrestling contest was canceled, Dunham said. “We suggested they don’t do that one because it seemed to promote gender stereotypes,” Dunham said. “That view of masculinity is a very limited view of what it means to be a man,” he said, stressing that the activities not only reinforced tropes that hurt girls and women, but also leaves out boys and men who aren’t interested in being macho. Dunham said he “can’t speak to” the reason the school continued the tradition despite previous objections. Nordquist said that although some students blamed her daughter for the controversy in 2017 because of the photos she posted, she learned that multiple parents had complained to the school. “[The district] made it clear this shouldn’t be happening anymore,” Dunham said.